G.U.M. 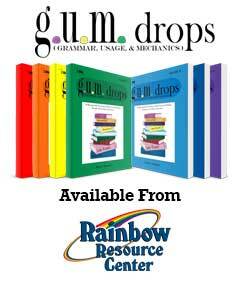 Drops?teaches Grammar, Usage, and Mechanics by having students edit passages from classic literature. Editing is a valuable skill for children to learn, both as a stand alone skill and to help them become better writers themselves. Good writers are also frequently those students who actively read good writing. Download free sample pages from any of the seven books! Want?more educational tools?& helpful information?